Construction of this palatine chapel, with its octagonal basilica and cupola, began c. 790-800 under the Emperor Charlemagne. Originally inspired by the churches of the Eastern part of the Holy Roman Empire, it was splendidly enlarged in the Middle Ages. 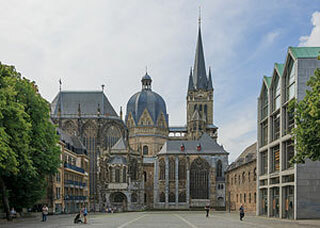 This article uses material from UNESCO World Heritage List article "Aachen Cathedral ", which is released under the Creative Commons Attribution-Share-Alike 3.0 IGO License.